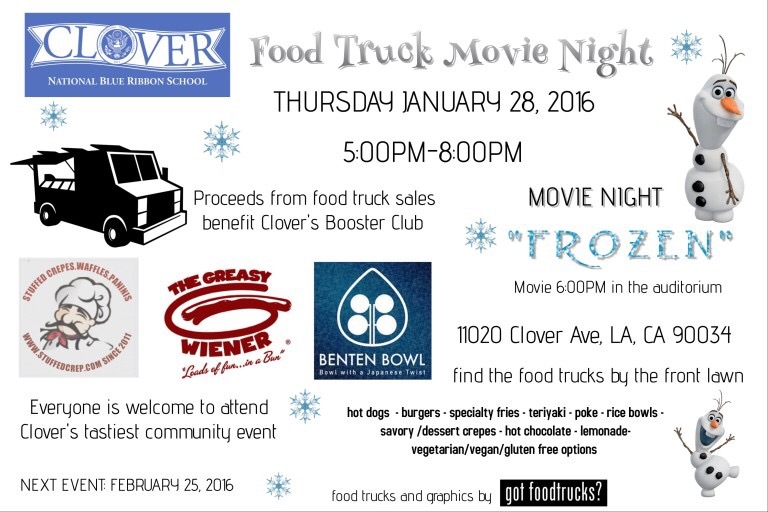 Join The Greasy Wiener at Clover Avenue Elementary in West Los Angeles for another fun community gathering featuring some of Los Angeles best food trucks on Thursday January 28, 2016. This month the parent booster will be hosting an indoor themed movie with a screening of “Frozen”,come for dinner and stay for the movie! We are there each month to support the school’s fundraising program along with some food truck friends, joining us in January serving a variety of eclectic gourmet street food : Japanese, French and desserts from BenTen Bowl and Stuffed Crepe . There will be something for everyone from hot dogs, sausages, burgers, specialty fries, teriyaki, poke, rice bowls, sweet and savory crepes. Also available for purchase fresh squeezed lemonade, hot chocolate and coffee! There will also be vegetarian, vegan and gluten-free options for those with dietary restrictions.